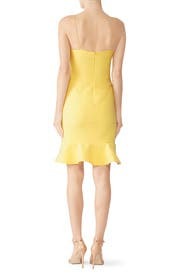 Slinky spaghetti straps suspend this flouncy (and flirty) little sheath dress by LIKELY. 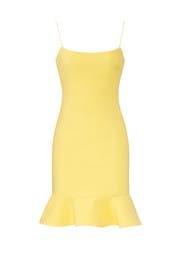 Yellow woven (67% Polyester 27% Rayon, 6% Spandex). Sheath. Sleeveless. Square neckline. Hidden back zipper with hook-and-eye closure. 36" from shoulder to hemline. Imported. I love the fit of this dress but the straps are just too long. Rented this for a Havana Nights themed Gala! Loved the color, the shape fit me to perfection and it held me in no bra needed. Wish I could keep it! I received compliments all night and continue to through pictures. A stunning dress. Amazing fit & flirty but sophisticated fit and length! I felt beautiful. Rented it for an extra outfit to going out in and for a sister photo shoot! Absolutely loved the fit, color of this dress. One of the sexiest dresses I've ever worn!! Much attentionyou will feel like a beautiful flower in this dress! obsessed with this dress! I ended up buying it. got a ton of compliments on the color. The straps were a great length for me and so was the length of the dress. It is definitely a little thin but does a great job of showing off figure. The dress was extremely tight and showed my hip bones and everything. 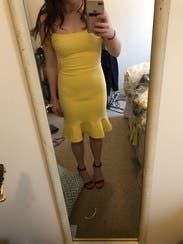 Nice quality dress but just runs much too small. Plus it's see through since it's so tight.